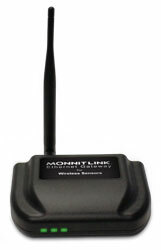 Monnit Ethernet Gateways communicate between Monnit wireless sensors and the iMonnit online sensor monitoring software. With support for various external interfaces, the Ethernet gateway is able to capture sensor data and send it to your existing system as well. This makes it a perfect fit for data centers and medium to large businesses. • Integrated web server for custom configuration direct from PC. 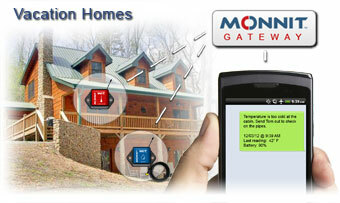 • Can interface with Monnit Express local PC software. 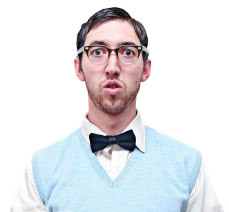 New Lower Price on all Motion Sensors! 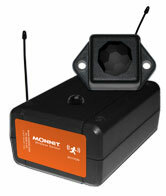 Monnit wireless infrared motion sensors are now available at a new, lower price. 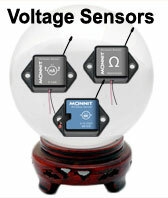 Monnit's development team is hard at work developing new wireless voltage sensors. Working with our customers, we have been able to determine a variety of voltage specific sensors that are needed for various applications. Among these new products are; variable resistance sensors, 0-5 VDC voltage measurement sensors, 0-10 VDC voltage measurement sensors, 1-50 VDC voltage detection sensors and 0-1 mA sensors. These new additions to the Monnit product lineup will be available in the near future. If you would like to learn more about these products or be notified when they are available, please email us at sales@monnit.com. 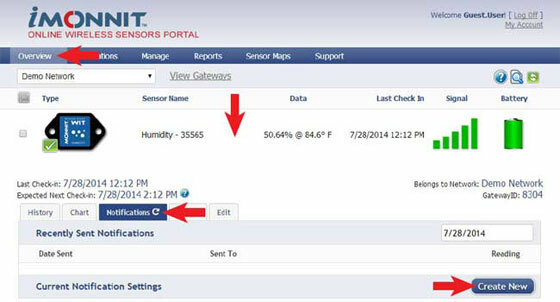 Notifications for a single sensor can be created, deleted or edited by clicking the "Notifications" tab in a sensor's detail view. Notifications can be created, deleted or edited for any sensor or group of sensors by clicking on "Notifications" in the main menu. 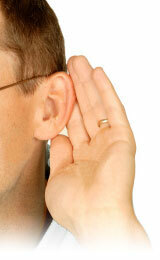 Sensor Reading Notification - Reading notifications are sensor specific (i.e. water sensor = trigger alert when water present, temp sensor = trigger alert when temp is above 70F, etc.). 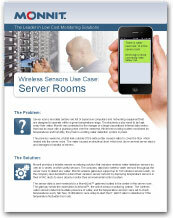 When creating a sensor reading notification, you will need to choose the sensor type you are creating the alert for. The select box will only show sensor types that are currently being used on your sensor network. Battery Notification - Allows users to define a battery power percentage level that will trigger an alert from the system, warning them to replace batteries. Inactivity Notification - Set-up “Inactivity” notifications to alert you when your sensors have stopped communicating with the servers. Failure to set up an “Inactivity” notification will result in no email/SMS text being sent should your sensors stop communicating with the servers. Advanced Notifications - Allows the user to set notifications based on advanced rules, such as comparing past data points with the current one to determine if a notification should be sent. Existing Notifications - Use notifications that have already been created on your account with the selected sensor.